There’s much to explore at Dickinson College. And now you can do it virtually, from nearly anywhere in the world. 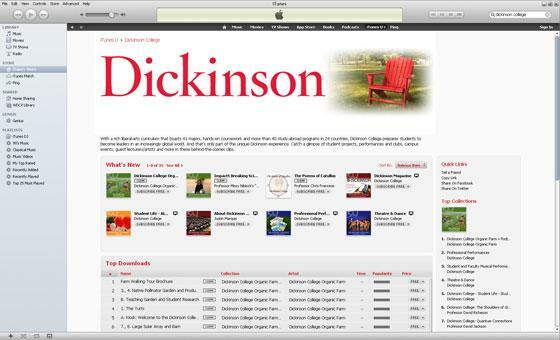 You can view free video and audio presentations about Dickinson from our new iTunes portal. Simply select the clips of your choice and view or listen to them on your computer. Or, download them to your iPod or other portable device. You’ll see student productions and projects, meet faculty and students and get an insider’s view of our classrooms, social spaces, athletics facilities, concert halls and galleries and more. Visit Dickinson College on iTunes U. Learn more about iTunes and download software for Mac or Windows by visiting Apple's Web site.